I’ve been trying to eat a lot of vegetables, but during the winter it seems a lot of them tend to be variations of green and beige! Sometime it can be hard to get those winter veggies- I like to focus on leafy greens and root veggies. Great tips! Sitting less is a struggle for me, but I’m working on it! I’m working on eating less processed foods right now—and will be cutting out refined sugars sometime soon, I think. It’s time for another cleanse! It can be hard to eliminate processed foods but so worth it!! 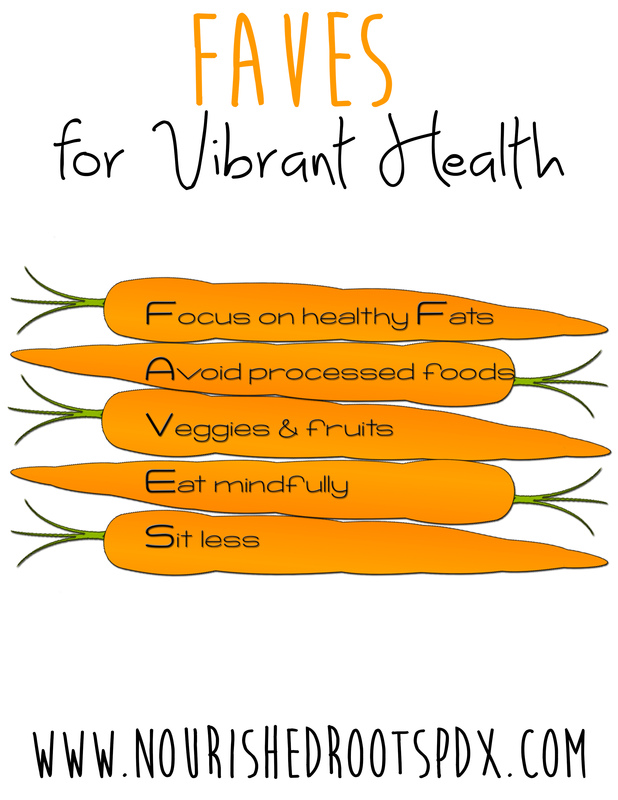 FAVES- great acronym to remember to be healthy. Yes, I wanted to make it easy and catchy! This is such great advice! I love the acronym, the graphic, and the message! Definitely an idea worth spreading! Thanks for your positive thoughts- I love it too! I love this list! It’s so hard to narrow down to the essential few, but I think you’ve done it. A few other things I notice positively affect vibrant health in my personal life and what I see lacking the most with my clients are: eating fermented foods to support gut health, making self-care part of a regular routine, and practicing gratitude/living in the present. These are great additions! I too am a huge fan of taking care of gut health- the science behind the importance of gut health is fascinating to me. fantastic tips! healthy fats are important! Yes they are and so many people are very out of whack with their omega-3 to omega 6 fatty acids. I too love the simplicity of this concise, yet vital, message and the powerful graphic impact of the design. It is so easy to embrace, remember and share. As a publishing professional and writer, I learned the hard way that sitting too much can cause serious health problems and is considered to be “the new smoking”. Thank you for sharing these FAVES with us on the Healthy, Happy, Green and Natural Blog Hop. I am pinning and sharing! Mindful eating is one that gets missed a lot. My husband and I put together a “mindful eating challenge” on his blog last year, http://www.grassfedgeek.net/2014/05/mindful-eating-challenge-improving.html, and it was really interesting to intentionally slow down like that. I also just blogged about sitting less! Well, sitting in CHAIRS less. http://www.create-enjoy.com/2015/02/weekend-inspiration-sitting-on-floor.html. Are you familiar with Katy Bowman? Bet you’d love her stuff! Yep, I think I so almost all of these except “veggies and fruit” – I eat almost no fruit but veggies with every meal. Although I don’t do leafy greens all that often since it’s so hard to get enough in a serving, they pack down! Haha!